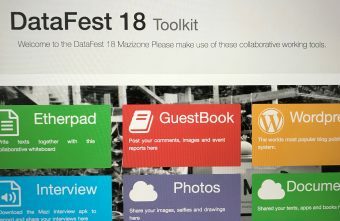 MAZI Hackathon at DataFest18, Edinburgh, UK. Program Or Be Programmed: The implications of small data, local context and “Do-It-Yourself” technologies. As Big Data is becoming the standard raw material for creating technological products and services, participants in these two linked events will revisit Small Data, and discuss its potential uses and the implications for technologists, designers and end users. Questions raised during the hackathon and symposium will address topics around; the relationships between citizen generated data and design innovation, the open data movement and the sharing economy, and mechanisms or toolkits to support new models of creativity. The advantages of small data, according to Rob Kitchin (2014), include its focus on specific cases and its ability to tell individual, nuanced and contextual stories. As Kitchin says; “… if big data is an unmanageable deluge, then small data can be oases of data within a data desert”. 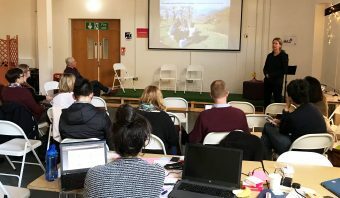 Presented by the EU H2020 funded MAZI project (Developing a DIY networking toolkit for location-based collective awareness), the event presented an alternative view on data technology, focusing on “small” data, citizen empowerment and grassroots action. The MAZI project is a three year project investigating the uses of low-cost community WiFi networks and the software services that can be built with them. MAZI is working on four pilot studies, in Berlin, debating rights to the city; in London, helping marginalised communities find a voice when faced with gentrification; in Zurich, encouraging democratic participation; and in Greece, exploring how artists can help local communities reflect on their situation.